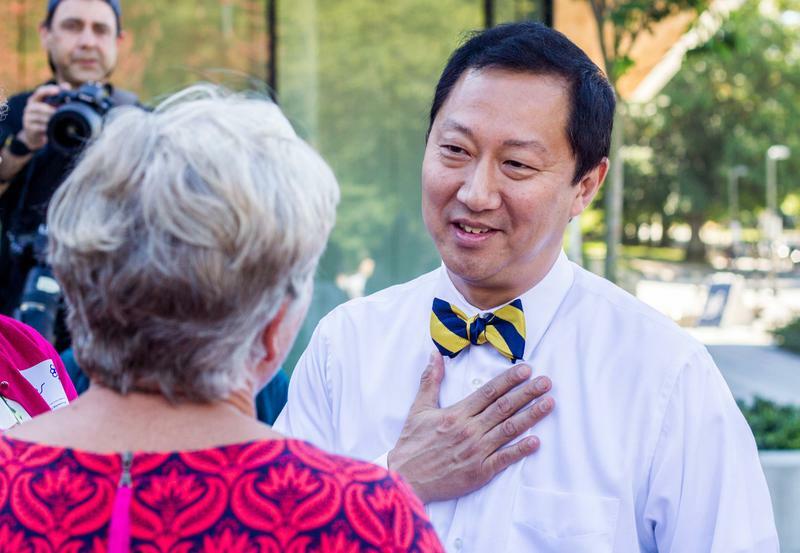 Today is Santa Ono's first official day as UBC president. To start his five-year term, Ono held a “coffee talk” meet and greet from 10:30 to 11:30 a.m. this morning. The event was popular with students, faculty, staff and animal rights protestors all in attendance. President Ono told The Ubyssey that these sorts of events will not be exclusive to his first day. In the future, he said there will be events at Norman Mckenzie house as well as visits to different faculties and buildings to engage with students and faculty. "Connecting with the community is very important — and in a very spontaneous way," said Ono. "You’ll come to expect this from me." This method of community outreach appears to be effective based on the number of people who came to welcome the president on a Monday morning. "I woke up this morning, saw the email sent by UBC and I thought it would be a great opportunity to talk to the president," said second-year international economics student Tudor Schlanger. Schlanger hoped to talk to Ono about his vision for the campus, as well as his plan for rising international tuition fees. "All sorts of questions, but mainly I just wanted to see what he has to say," he said. The open invitation to meet the new president also drew several animal rights protestors from STOP UBC animal research. Ono stopped to talk to the protestors during his meet and greet. 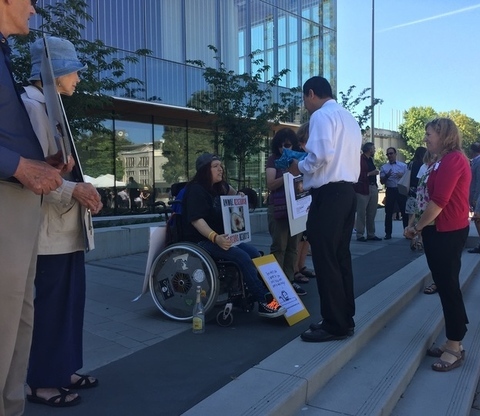 "Today is the first day of President Ono’s new term and we’re hopeful that he will continue the innovation that Dr. Piper and Dr. Gupta were working on to bring UBC into the 21st century and not to go back to the dark ages," said protestor Anne Birthistle. "We’re hoping that Dr. Ono, as a biomedical researcher, won’t nullify [the ongoing conversation]." Ono stopped to speak to the protestors, who he asked to send him their presentation on animal rights and animal research at UBC. "It’s something that is incredibly important to me. I love animals, but I’m also a medical scientist. It’s a complicated issue, but I’m really looking forward to reading about their proposal," said Ono. 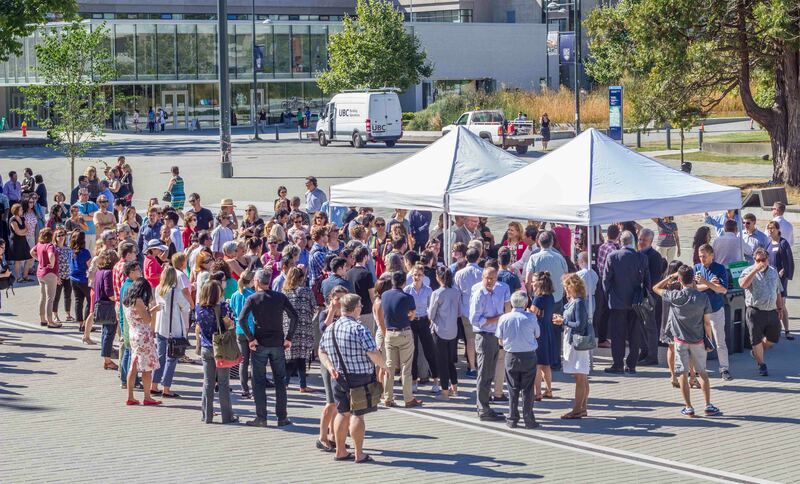 Grace Wong, who currently works at the office of the provost and VP academic and who has been at UBC for approximately 30 years, summed up what seemed to be attendees' feelings on the event. "It’s a beautiful day, and a great start to a new presidency," said Wong.